I'm a committee member and volunteer for a local charity which rehomes retired racing greyhounds and given half a chance I can bore for England on the joys of living with these most noble of hounds. 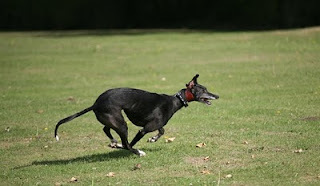 Two of my hounds are retired racers; Jasper (pictured above) and Stevie (pictured later in this post). Mina was a stray, and to my knowledge, has never raced. Greyhound racing is an emotive subject which is often in the news. I 'd like to state that I am neither for, nor against greyhound racing, which may seem at odds with my love for the breed. I have spent time at racing kennels. I have been to greyhound races at different stadia in the UK and, through the Lincolnshire Greyhound Trust, I work with retired racing greyhounds looking for their forever homes. What is apparent to me is that the majority of the dogs I have seen have been well looked after and well cared for - both on and off the track. It is unfortunate that what appears to be a minority of trainers with little or no regard for their dogs' welfare make the news, but then again 'bad news' sells newspapers! There is still no excuse though, for mistreating these animals and one ill-treated hound is one hound too many. The charity works closely with a number of trainers and we have waiting lists for dogs to come into our kennels. 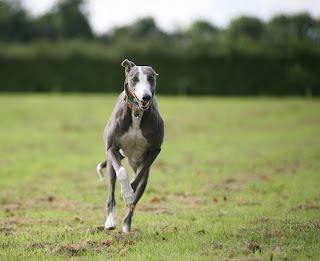 The hounds we rehome come to us at all ages... some are young and have no chase instinct, some are not successful racers, some have had injuries and have retired early, and some come to us at the end of their racing careers. It is true to say that greyhound welfare needs to be improved by those making money out of the sport. New legislation is being introduced by the UK Government in April 2010, which goes part way to redressing this and influential charities such as The Dogs Trust are continuing to campaign for improvements to greyhound welfare. A campaign which I support fully. In the USA many states have banned greyhound racing; racing is per se illegal in 36 States and Massachusetts is the latest State to ban commercial dog racing. In the UK many tracks have closed with Walthamstow closing in 2009. However, what would happen if greyhound racing was banned in the UK? Would it be driven underground to independent (illegal?) flapping tracks, which may have even less regard for the hounds' welfare? What would happen to the thousands of dogs that used to race at licensed tracks? What would happen to the breed as a whole? Unlike pedigree show dogs, racing greyhounds are bred for strength, fitness, health and stamina NOT for looks. A show greyhound does look somewhat different to a racing greyhound. "Last Friday we went along to Peterborough to watch Chapelane Mac race. Now, no-one was more surprised than me to find myself there: I am your stereotypical tofu munching, knit your own tea bags ,tree hugging animal rights placard waving lefty when it comes to stuff like this.Yes I am the sort of person who thinks the Grand National should be banned and I've put my money where my mouth is when it comes to anti fox hunting etc etc.So you can guess that I was probably never going to feel too comfortable with the idea of dog racing. Anyway I went along because I wanted to see for myself what its all about and try and get an informed view of what the dogs' experience of track life actually is. The dogs were there for all to see getting prepped up for their race.We watched the trainers go through the pre-race stuff and the dogs all looked happy and some were obviously very excited and couldn't wait to be off. Chapelane Mac (Jock) was looking beautiful and was very perky and impatient for his race. Fine looking boy that he is, I'm sure he'll create a wave of adoration when he retires! As they were paraded up and down the track I really enjoyed seeing how alert and proud the dogs looked. It was lovely to see them in the peak of physical health and so beautiful. The atmosphere was very exciting. The call came and the dogs were put into the traps. I dont like seeing this bit as to me it has looked like they are positively stuffed into them against their will. But into the traps they went and the bell rang.The dogs took my breath away as they flew out of the traps. I couldn't believe the power and the speed. It was one of the most exhilarating things I have ever seen. Jock looked like he was having the time of his life and before I knew it I was yelling my head off for him to run run run! At the end of the race the hounds all bounded up to their trainers not looking the least bit tired and it was back to the kennel block. This was the bit I was really impressed with. I watched the staff carefully towel down and clean each dog. Faces were washed free of sand and feet were washed,inspected and nicely dried too. They all had plenty to drink and time to recover. Much like we all do with our own hounds really-there seemed that same kindness and care. After a few more thrilling races I decided to get a closer look at the dogs going into the traps so went down to trap side. Ok some of them didn't look terribly keen on going in, but they didn't look terrified either. They weren't being 'stuffed' in-they were being lifted in! It amused me to see one or two trainers whispering in their dogs ears as they waited-I like to think they were giving them a last minute pep talk but they were just probably keeping them calm. Once in, it sounded like the dogs were excited about what would come next judging by the pawing and yapping! I loved the whole experience to be honest. I know I only saw a tiny window on what greyhound racing is really like and fortunately no dogs were injured but the dogs really did seem to love it. Of course I wasn't really expecting to go down there and see nasty people beating poor exploited Grey's into racing their little hearts out without so much as a bowl of water afterwards but I did have preconceived ideas about how I felt about making money out of dogs etc .And I now feel more at ease with the whole idea. I also feel like I understand my own dogs a little bit more now that I have a tiny insight into their 'other' life. Especially Seamus who loves to run still and regularly acts the fool and tries to get me running him on his lead. I'm so glad I went and it certainly wont be the last time. I'd recommend it to anyone else like me who doesn't really know much about the world of racing or who hasn't made up their mind about what they feel about it. I feel more confident about dispelling some of the myths that the general public tend to bring up at meet and greets too. I know that we have some really responsible trainers who contribute here and I have already been able to tell the public about the additional support that they provide to the trust.So...yes...give it a go. And its worth the trip for the carpet in the main bar alone! " Jayne really needs to be able to make an informed decision about greyhound racing. Behind the glamorous facade of a 'Night at the Dogs' the reality is shockingly different. Greyhound racing is not a sport or even a leisure industry - it is a multi billion pound gambling industry which fails to comply with many UK and EU laws - afforded self regulation, in order that the government can rake in the revenue generated on the betting without having to lift a finger. Greyhounds continue to be destroyed simply because they are no longer financially viable to 'maintain' as a gambling unit. Please do not support commercial greyhound racing and the inherently cruel practices that make it pay. It is unacceptable what some breeders/trainers do to their dogs and better regulation is required. Both Jayne and I volunteer for a charity which rehomes retired racing greyhounds and we do see both sides of the industry. I've also heard some shocking stories of how the greys are treated by some trainers, and also how they are disposed of when they no longer race. I understand how you could find it exhilarating though, I went to one greyhound race before adopting Tess and also found it exciting. I don't think I will be going to anymore though.